Pendulum oracles are very popular for their ease of use and effectiveness in contacting one’s own psyche as well as other outside entities. Here is how to choose a perfect crystal for your pendulum, to get the most out of your divination. Using a pendulum is incredibly easy. Finding a pendulum that will fit with your particular biorhythm is disappointingly not as simple – there are several things to consider for it. 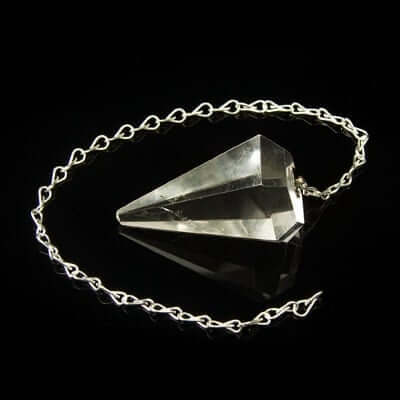 To choose the perfect crystal for your own pendulum, you can go about it one of several ways. Here we will discuss the intuition method and the numerological method for dowsing. If you have the opportunity, go to a local occult shop. They generally have a very good selection of stones and gems to choose from, and they will often have them laid out on a table or horizontal case. While this is partially to make it easier to observe the stones, the other reason they are on such a horizontal surface is so that it is easier to intuit the stone that fits your energy signature. Stretch your hand out over the stones, and close your eyes. Picture your own body, and feel the energy that flows through your veins, that emanates from your skin like an aura. Slowly, move your hand over the stones, and look for indications. They could be as subtle as a tingling in your fingers or a sudden itch on your palm, to as overt as a static shock or vibrating feeling in your entire arm. Pull to one side any crystals that give you these indications, and repeat this process until you narrow your choices down to just one stone. The stone with the strongest reaction to your energy is the stone that resonates at the same energy signature, or as close as you will find, to your own. Your name is a powerful indicator of your particular energy signature. If you do not have the ability or opportunity to use the intuition method, you can divine which stones would be a good fit for you by using numerology. Using the usual method, find your name’s numerological value. Do the same for the common name and scientific name of the stones (you can look up the scientific classification of a stone easily on Wikipedia), and compare the numbers. Numbers that are one number above or below your specific number are good fits, but a perfect fit will match your number to the dot. Next What Do Birthmarks & Moles Tell?